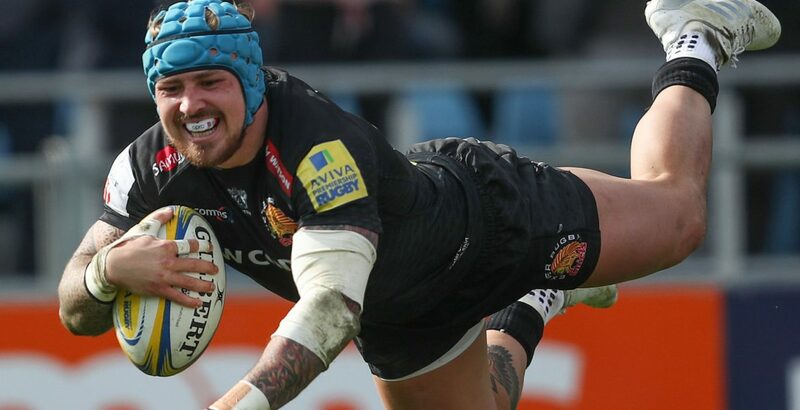 Jack Nowell scored two tries on his Exeter return as the Premiership leaders beat Gloucester to move to the brink of securing a home semi-final. Owen Williams kicked the visitors into an early lead, but Alec Hepburn and Sam Simmonds hit back in quick succession. Ollie Woodburn touched down to make it 22-3, as Gloucester finished the half with Ruan Ackermann in the sin-bin. Callum Braley pulled a try back before Nowell's double and Gareth Steenson's try completed the bonus-point win. Victory, which guaranteed Rob Baxter's men a play-off place a week after they clinched the Anglo-Welsh Cup, means two points from their final three league games would also confirm a home semi-final. Gloucester head coach Johan Ackermann said before the match that the seventh-placed Cherry and Whites - who remain five points adrift of the play-off places after the defeat - could go to Sandy Park and "enjoy it" as they almost had nothing to lose, and his players certainly took heed of the message early on. Centre Henry Trinder went close to landing the game's first try in the opening minute, but his diving finish in the left corner after collecting his own grubber kick was ruled out after review by the television match official. Williams' sixth-minute penalty, however, was all they had to show in a first-half made worse by the loss captain Willi Heinz to injury, as a combination of diligence across the park and belligerence from the pack saw the Chiefs hit back with devastating effect. Hepburn twisted over for the game's first try from close range, then Simmonds grabbed his 12th five-pointer of the campaign and his brother Joe teed up a penalty before Ackermann was shown a yellow card for kicking at the ruck. Woodburn went over with the final play of the first 40 minutes to help open a 17-point lead, but Gloucester responded immediately after the break with Mark Atkinson dummying through the defence to set Braley up for his side's try. England winger Nowell made an explosive contribution off the bench in his first club appearance since December, showcasing his sublime finishing touch to grab Exeter's fourth and fifth tries before Steenson completed the comfortable victory. "I'm so glad to be back as one of the toughest things to do is to watch the boys go out and enjoy themselves. "I've had a bad run of injuries this season but every single player goes through them, although it was pretty disappointing to have to check out early on the Six Nations. My body feels good at the moment. "The squad is in a really good position for having had the taste of winning the title last season, we know what to expect but want to repeat it." "It was always going to be difficult (to reach the play-offs) and now it's out of our hands but we still have a big three weeks coming up, with home league games against Harlequins and Bath and a European semi-final sandwiched in the middle. "If we can win these it will be a decent season for us, so there is a big responsibility on our shoulders. "Today Exeter were ruthless. We started well but our discipline cost us and you can't play catch-up against a side as good as Exeter. "Even after five minutes I knew it wasn't going to be our day. Bounces were going their way, a few decisions went against us with forward passes missed so I felt everything was against us." Exeter: Turner; Whitten, Slade, S Hill, Woodburn; J Simmonds, White; Hepburn, Cowan-Dickie, Francis, Skinner, J Hill, Dennis, Armand (capt), S Simmonds. Replacements: Yeandle, Moon, Holmes, Lees, Ewers, Townsend, Steenson, Nowell. Gloucester: Hudson; Sharples, Trinder, Atkinson, Marshall; Williams, Heinz (capt); Hohneck, Hanson, Afoa, Savage, Slater, Ackermann, Ludlow, Morgan. Replacements: Matu'u, McAllister, Balmain, Thrush, Polledri, Braley, Burns, Twelvetrees.